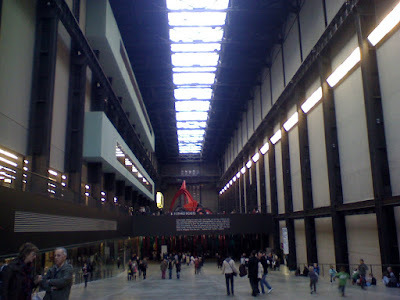 Yesterday, myself and my eldest son Christopher decided to have a day out in London, starting off at the Tate Modern. He has already been there-last week, but only saw a limited amount, so we went for more of a look. 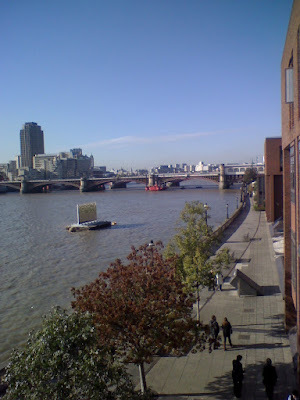 Here are some pictures of us walking towards the Millenium Bridge to get to the Tate on the South Bank. 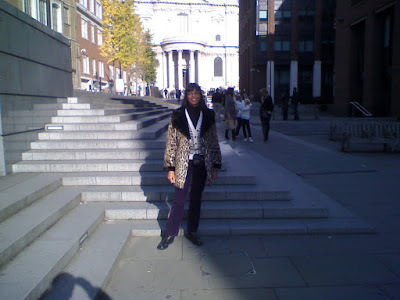 It was freezing, so I wore my trusty faux fur leopardprint coat, with my M&S stripey cardi, M&S polo neck and H&M purple cords. 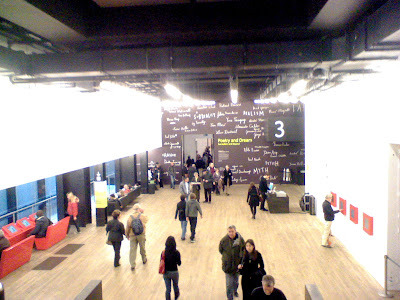 We had a really nice look around the Tate Modern-I had pre concieved ideas of what it would be like (as in I wouldn't like it! ), but was pleasantly surprised. I particularly enjoyed the works of Matisse, Monet and Picasso. There was also more modern day works of art, videos, sculptures and 'things' which were also very modern and interesting!! 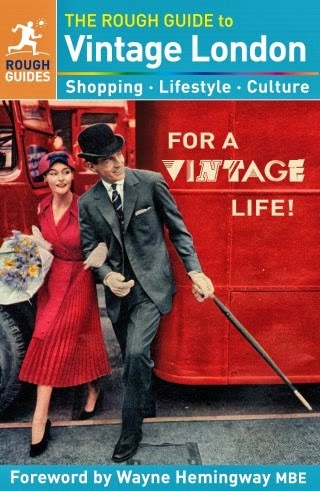 So, after our intellectual jaunt, we decided to hit the West End for some window shopping and erm, shopping! We left the Tate Modern and was in Oxford Circus in no time! We hit NikeTown for Christopher (no purchases here) then H&M-yes for me!! I was very good, even Christopher said 'I can't believe how quick you were in here mum!' I went straight for the woolly hats, got 2, queued to pay, saw some legwarmers, grabbed them, paid and out-phew! Then we went to Hamleys for some Christmas ideas-currently Lego is at the top of the list and by this time we were hungry so we headed to Argyll Street, for some chinese food-sweet and sour pork with fried rice and noodles-oh, so yummy! We went to Carnaby Street and I looked in American Apparel for a browse-I saw some lovely wool cable leggings, but resisted temptation. Then we hit a London souvenir shop for a wander and then Christopher went into a shop called 'Size' and got himself some great Reebok trainers in the sale for only£20-they're really awesome, he loves them. So, all shopped out, we got on the train and came home. We had a great day out and even managed to dodge the rain too!! I was there...sayyyyy 4 years ago?? :P Loving the leopard. Need to get some animal prints myself. Hi lil midget-thanks for stopping by with your lovely comment and yes, lets exchange links!! I want to visit it so much! 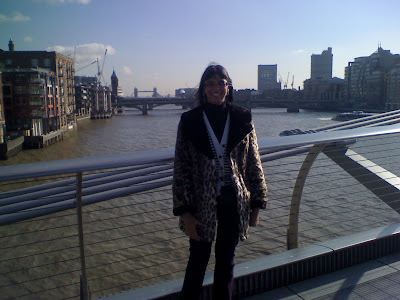 Love London! What a fun day...I've been thinking of purple cords for ages and you've made me really want a pair. Hi Angel-London is great-you must see it if you ever get the chance!! Hi Wendy-oh go for it-its a colour that will always be perfect for autumn wear! Hi always in style-thanks so much, it is lovely and warm too! makes me want to break out my leopard jacket! and your comment made my day! Hi emma-aah, you're soo welcome, he'll love this of you!! awww what a nice lil outing...i wanna see the goodies u bought! Hi ren-LOL, you'll see the hats fairly soon, now its getting colder! have fun a london. have a macaron for me at harrods. Hi Sharon! What a wonderful, wonderful time you must have had! It's remarkable that Christopher likes to go shopping with you! My brother, when he is forced to go shopping with my mum, he always complains so much! Lovely photos. It's freezing here too. Hi Savvy-I must do this soon, I'm dying to know what they're like!! Hi cate-thanks for your lovely comment! I am pleased he still enjoys going out with me, LOL!! Hi anny-oh yes it was really lovely-thanks so much my dear!! Hi S-always so lovely, thanks a lot my dear!! What a FUN day. Wish I could've tagged along! Hi Sal-oh, I would have liked that very much!! Great pictures. 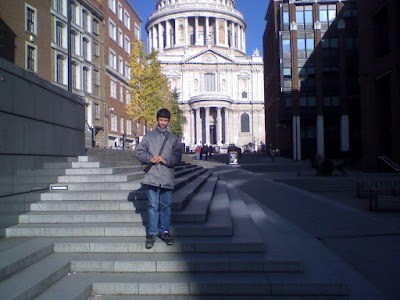 I have always wanted to visit London, I don't know if I will ever get a chance to go. I mean I know I probably will in a few years when the dollar has not "tanked" so badly that I can afford to go. Overseas travel just isn't worth it with the US exchange rate the way it is right now. Hi budget chic-yes, I'm very lucky to live right on top of London-it is a wonderful city which I love very much. Hope you get to visit one day! Love the leopard jacket. Looks like a lovely day! awh great day out - I was there on Sat. It's quite a good art space not stuffy and distant. No sshing. And then a west end jaunt perfect! Isn't fun when you can include a son! Looks like you had a wonderful day. you cannot imagine how jealous I am. 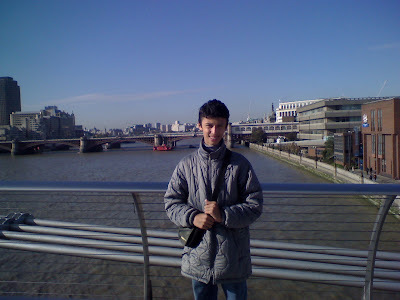 I miss London so much! I love that bridge -despite many people hate it- by Norman Foster, he's really the architect of London at the moment. 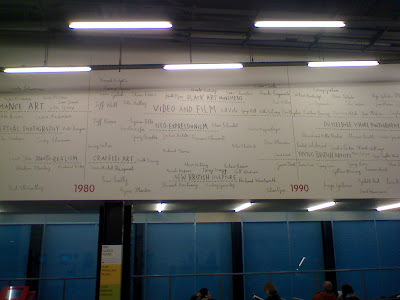 And the Tate Modern, well, one of my favourite museums in London. Have you seen the sculpture The Kiss by Rodin? I love it! and I was shattered when I saw it there!!! what a fantastic day with your son, art and shopping, perfect! Looks like a wonderful mother son adventure. haha. Hi Silje-thanks so much, it was fabulous!! Hi kate-yes, the Tate was much better than I was expecting!! Of course, the West End afterwards was great too, LOL!! Hi Lenya-yes, we both really enjoyed it, thanks! 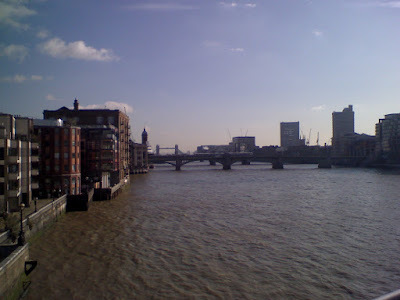 Hi Atelier-I was definitely inspired by the Tate and London is such a fantastic city, I agree! My son doesn't like the bridge either-he thought it would cave in, LOL!! Hi fashion herald-It was a really great day, thanks so much! Hi nay'chelle-yes, we both had a fabulous day out, thanks! Hi Imelda-you must see it one day, hopefully! 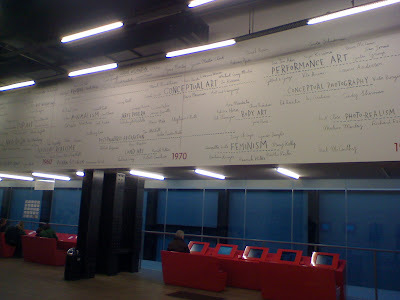 I completely agree with you about the best peices in the Tate Modern being Matisse, Monet and Picasso - some of the other peices that I saw when I went in July were a little bit challenging for me. 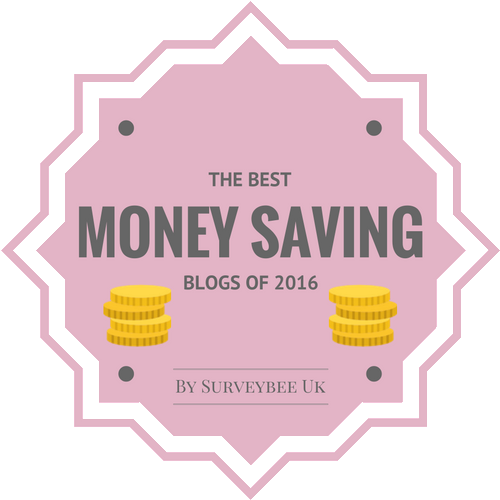 Did you see the one that had all those bricks laid out on the floor, all lined up? It really makes you question the definition of art! Hi emma-thanks for stopping by! Yes, I'm not into items classed as art, such as pieces of wood or bricks-each to their own I suppose, LOL! Hi marian-always so lovely, thanks my dear!! We had a great time and I love my purchases from H&M-I adore being cosy, haha! !